Its been said that Australians will bet on anything…. 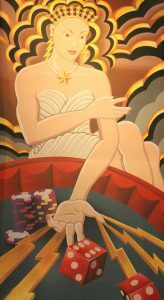 The term “Problem Gambling” includes, but is not limited to, the condition known as “Pathological”, or “Compulsive” Gambling, a progressive addiction characterized by increasing preoccupation with gambling, a need to bet more money more frequently, restlessness or irritability when attempting to stop, “chasing” losses, and loss of control manifested by continuation of the gambling behaviour in spite of mounting, serious, negative consequences. People around the world have been gambling for many hundreds of years and it has been part of Australian culture since European settlement. For most Australians gambling is an enjoyable form of entertainment. Gamblers come from all walks of life and sections of the community. For most people it is an enjoyable pastime that does not cause any difficulties because people are able to control their behaviour and are prepared to spend and lose what they can realistically afford. For a small proportion, however, gambling has negative social consequences. For every person who has a problem with gambling it has been estimated that another five people are affected. The frequency of a person’s gambling does not determine whether or not they have a gambling problem. Even though the problem gambler may only go on periodic gambling binges, the emotional and financial consequences will still be evident in the gambler’s life, including the effects on the family. Although no substance is ingested, the problem gambler gets the same effect from gambling as someone else might get from taking a tranquillizer or having a drink. The gambling alters the person’s mood and the gambler keeps repeating the behaviour attempting to achieve that same effect. But just as tolerance develops to drugs or alcohol, the gambler finds that it takes more and more of the gambling experience to achieve the same emotional effect as before. This creates an increased craving for the activity and the gambler finds they have less and less ability to resist as the craving grows in intensity and frequency. Some of the reasons for gambling may include; a way to escape bad feelings, eg anxiety, loneliness, depression, sadness and grief; a way to cope with feelings of stress; to relieve boredom; to feel accepted in a group; to cope with unhappy relationships or a way out to solve all their problems. A gambling problem can ruin relationships. It can make children embarrassed to bring friends home as there is not enough money to stock up the fridge or offer food, buy clothes or go on school outings. Love goes out the window. If this is a problem you or someone else has, it is time to deal with it so you can get back on track. The client, who I’ll call “Peter” (not real name), phoned the AHA Free Advisory Line to see if he could find some help with his gambling problem. We offered Peter a free session if he would be willing to undergo therapy in front of the delegates at the workshop. Peter accepted. As I was not going to meet Peter until the day of the workshop, I communicated with him by email to obtain his history. Gambling became a problem in his early twenties and did progress steadily. As his disposable income increased so did the gambling. Peter started work at 14 going to pubs gambling with his employer, and not long after that on card machines. There was no background of any major injuries, bullying at school or other abuse. He was not on medication. He slept a maximum of 6 hrs a night which had been the case for a long time. Peter’s parents had separated when he was 15 years old. He had ups and downs with his parents but their relationship with him now was generally, loving. The relationship with both parents now is loving and stronger than ever. Peter was now 36 years old, has been married 15 years and they have one child that Peter adored. Stressful situations at work, and with his relationship, gave Peter a feeling of depression that he said made his mind somehow believe would get better with a win on the poker machines. He would play the machines alone in most cases. His coping strategies were to use mechanisms to try and stop gambling through working excessive hours – 100 hrs+ some weeks to try and stop his mind thinking of the machines, but that in turn created more relationship stress and body stress that would in turn complete the cycle. Peter had handed over his finances to his wife in an endeavour to remove access and temptation. He felt shame and guilt, but most of all disappointment that he was unable to curb this self destructive behaviour. I met with Peter outside of the workshop room when he arrived and exchanged greetings and discussed the information he had given to me. I asked if it was all right for me to bring up these things in front of the delegates. He said that he had no problem with this. An explanation of hypnotherapy, the varying methods of EFT, EMDR, TIR, and expectations were exchanged. I asked Peter if he would mind exploring what the 15 year old feelings and emotions were when his parents separated, as we often see things differently as a child. He was agreeable to do this. A hand-lift induction and progressive relaxation for deepening were affected. A count down from 5 to 0 with instructions to go back to the time his parents separated. Peter said that he had always blamed his mother for finding another bloke and he had felt sorry for his father. Going back and looking at the breakup with today’s eyes he told me that his father worked such long hours that he was never there for his mother. Through the use of SUD’s (Subjective Units of Distress) ratings we used EFT to tap on feelings. We used hybrid version of EMDR with a ‘Disconnect Now’ – and let the grown up Peter take over. And to demonstrate the TIR method, Peter did a viewing process of the important aspect of the breakup that led to a further release and greater understanding. During this therapy Peter had the realization that he was doing exactly the same thing to his wife that his father had done to his mother i.e. working extended hours and not being there for his family. When asked what he would prefer to happen he said that he wanted to be a perfect father to his daughter and be there for his wife. Ego strengthening suggestions completed the session. By the time Peter and I finished talking as people were going home, he already saw himself as taking his daughter out and was telling me how his wife really loved him and she had said to him that she had to get to know him all over again because she had got used to living without him. Emotional Freedom Techniques (EFT/H) (Craig & Fowley 1995). Peter advised that since the session on the 5th April, all was going well. He no longer even registered the noise of the machines, and when he did hear them, he had zero desire to gamble since. He reported that the family were very happy and enjoying the new calmer dad that spends less time at work and more time with them. Since I have had the Hypnosis therapy I have had no thoughts or desires to gamble it has completely changed my life as I do not have to think about the answers I have to give if my wife asks me why the bank balance has dropped. I am able to go to the club after Golf for a beer and know that there is no desire to gamble not only poker machines but any type of gambling. I have been lucky to have a wife that will allow me to rebuild the trust that I damaged in our relationship through gambling. My relationship with my young daughter has become much closer as I have made them both my priority working less hours and taking the time to go to karate several nights a week getting fitter and also clearing my head. I do not think I would have been able to quit gambling without the hypnosis therapy. Peter has become a much more attentive husband and father since the therapy. He is developing a closer bond with his daughter through karate, and I no longer have to check our bank statements to make sure he hasn’t fallen off the wagon. Peter is home a lot more, and when he is he is a great deal more fun. I can’t thank you enough for your help; you have no doubt saved our marriage. Remove past emotional content in the trance state. Make re decision on past and future events.